Alljudteknik is a collaboration portal for technology companies. The group of companies can offer expert advice on: sound, light, image, acoustic, piano, control technology, audio furniture and advice. We can work as a consultant and/or vendor. We have access to measuring equipment for most areas of noise and vibration and our competence in these measurements is internationally recognized as very high. Visit the home page for more information. The sound you cannot find in a regular store! 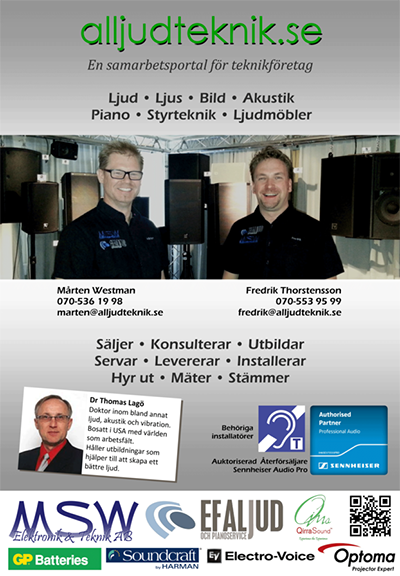 MSW Elektronik & Teknik AB is a company located in Småland Vimmerby, Sweden. We work for everyone’s enjoyment. We want to alleviate the high disruptive noise in cafes , restaurants, homes , workplaces . The sound is used more than anything else and are incredibly important for society to function. The security is most alarm fitted with siren and or speakers. Feature films would be as silent films without piano accompaniment , and how fun it would be even with accompaniment. The music would not exist and would not understand what they said on TV unless it was subtitled. Unfortunately, we live many as today. It’s easy to explain how it is to be blind. Close your eyes and try to walk a bit. But how it is to live with compromised or damaged hearing? Have you thought about that? A larger part than you think might have a hearing problem. Tinnitus is a common injury that makes it tiring to hear certain tones. MP3 players with too high volume is a cause that makes the hearing impaired creeping down the lower ages. Another reason is that the sound level is too high in kindergarten, in schools and often at home in the residence too. By providing schools, workplaces, homes and cafes with absorbers that removes some of the reverberation, we can help you lower sound levels without for that matter lower the volume on the audio source. Provide a good environment for the kids! We can be a part of the sound and together with our suppliers, we are much more. Do not hesitate to ask. If we do we not have the answers, we will try to develop it for you. We have a vast range of tools available! VILAX in Staffanstorp has taken an holistic approach to the design of furniture and accessories for restaurants, hotels, office buildings, schools etc. By using a nice design where loudspeakers and acoustic properties are integrated into the furniture, an environment where sound quality and “silence” has a much higher value than with traditional approaches. VILAX give the architect a high degree of freedom and their approach that “one” is the smallest series they make, helps created unique sound quality for the above mentioned applications and more. Their manufacturing capabilities also includes handling the main part of the production of the Qirra Sound loudspeakers. The collaboration gives multiple benefits for all included teams. Their conference and event center ÅvanpÅ (www.åvanpå.se ) is a great demo environment. STF Engineering Education’s mission: STF Engineering Education shall offer the best basic service in selected areas. Based on the market’s exacting requirements, our expertise and our customers’ own development. We shall also offer expertise to engineers. An essential part of our effort to live up to our mission is to STF’s organization has a self-propelling quality process that enables us to constantly seek and meet customer expectations. STF is an authorized member SAUF Sweden Authorized Training and certified according to EN ISO 9001:2000, which means that we are quality assured our procedures and processes in the education business. Visit their home page for more information. Bilda creates free zones where different perspectives meet, and where the interaction liberates people’s involvement. They offer educational and cultural activities in the form of workshops, courses and cultural programs. Life Interpretation in the broad sense is our profile.Visit their home page for more information.